We’d love your help. Let us know what’s wrong with this preview of Remarkable Trees of the World by Thomas Pakenham. The publication of Remarkable Trees of the World took American audiences by storm. Thomas Pakenham embarks on a five-year odyssey to most of the temperate and tropical regions of the world to photograph sixty trees of remarkable personality and presence: Dwarfs, Giants, Monuments, and Aliens; the lovingly tended midgets of Japan; the enormous strangler from India; and the The publication of Remarkable Trees of the World took American audiences by storm. Thomas Pakenham embarks on a five-year odyssey to most of the temperate and tropical regions of the world to photograph sixty trees of remarkable personality and presence: Dwarfs, Giants, Monuments, and Aliens; the lovingly tended midgets of Japan; the enormous strangler from India; and the 4,700-year "Old Methusalehs." American readers will be fascinated by Pakenham's first examination of North American trees, including the towering Redwoods of Sequoia and Yosemite, the gaunt Joshua Trees of Death Valley and the Bristlecone pines discovered in California's White Mountains. Many of these trees were already famous—champions by girth, height, volume or age—while others had never previously been caught by the camera. Pakenham's five-year odyssey, sweating it out with a 30 pound Linhof camera and tripod, took him to most of the temperate and many of the tropical regions of the world. Although North American trees dominate this book, Pakenham also trekked to remote regions in Mexico, all over Europe, parts of Asia including Japan, northern and southern Africa, Madagascar, Australia and New Zealand. To ask other readers questions about Remarkable Trees of the World, please sign up. Joyce Kilmer famously wrote about the beauty of trees, but he isn't the only one who's ever marveled at them. It isn't unusual to read news stories about activists who chain themselves to majestic trees in the hopes of rescuing them from developers' chainsaws. Trees have been the focal point of numerous novels and works of art, and many of us feel a strong affinity for a certain tree we may have loved and/or climbed as a child, or to the wondrous trees we pass, or stop to admire, as we travel th Joyce Kilmer famously wrote about the beauty of trees, but he isn't the only one who's ever marveled at them. It isn't unusual to read news stories about activists who chain themselves to majestic trees in the hopes of rescuing them from developers' chainsaws. Trees have been the focal point of numerous novels and works of art, and many of us feel a strong affinity for a certain tree we may have loved and/or climbed as a child, or to the wondrous trees we pass, or stop to admire, as we travel through life. But this book... THIS book... is like a visual love song to trees. Remarkable trees. Its title calls them "remarkable", and indeed, that's exactly what they are. The tallest... the oldest... the largest girth... the most unusual and glorious trees that most of us will never have the privilege of seeing in person. No need. Pakenham traveled the world over and saw them for us, and captured them in breathtaking photographs for us to enjoy in this book. Even if all you want to do is look at the pictures, this is a book you might fall in love with. But to get a full appreciation, you'll want to read the text, too, to discover some of the fascinating facts and histories about these trees. These remarkable trees. This is a book of postcards. It’s not in actuality a book of physical postcards (though that might be a fantastic manifestation of this work). But that’s what it feels like: amazing images with just enough explicatory prose to whet one’s appetite. Pakenham traveled the world photographing the most remarkable trees from Asia, North America, Africa, Australia, and Europe. Unfortunately, he did not write a book about it. He published a book of postcards instead. Gorgeous postcards, in a huge, hardc This is a book of postcards. It’s not in actuality a book of physical postcards (though that might be a fantastic manifestation of this work). But that’s what it feels like: amazing images with just enough explicatory prose to whet one’s appetite. Pakenham traveled the world photographing the most remarkable trees from Asia, North America, Africa, Australia, and Europe. Unfortunately, he did not write a book about it. He published a book of postcards instead. Gorgeous postcards, in a huge, hardcover coffee table book. But postcards, nonetheless. Beautifully illustrated book!! Amazing pictures of enormous and unbelievable trees...it makes me want to travel the world, just to see these trees in person. Breathtaking!! 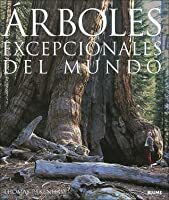 Interesting book with photos of unique and unusual trees, especially large ones. 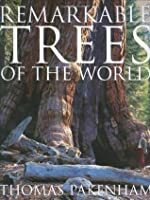 Really great book about trees. It could make you plan your travels just to see them. Great reference to use as you travel. Trees inspire me. The majestic power they possess is overwhelming. I like to think about how long they’ve been on this earth and dream about speaking with them as if they were the Ents of Tolkien’s tales. Not only do they provide us with the very air we breathe, they give us shade and comfort, teach us history and science. I could sit for days in and under branches and leaves absorbing their timeless wisdom. 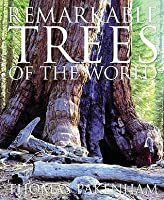 Remarkable Trees of the World is a wonderful book. It follows a man on his world quest to Trees inspire me. The majestic power they possess is overwhelming. I like to think about how long they’ve been on this earth and dream about speaking with them as if they were the Ents of Tolkien’s tales. Not only do they provide us with the very air we breathe, they give us shade and comfort, teach us history and science. I could sit for days in and under branches and leaves absorbing their timeless wisdom. 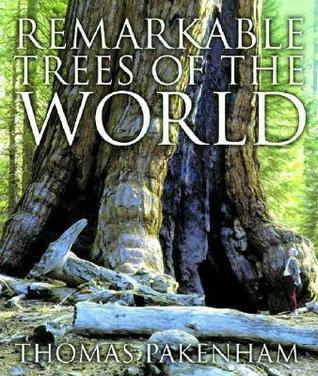 Remarkable Trees of the World is a wonderful book. It follows a man on his world quest to see the most amazing trees earth has to offer. Usually when I read non-fiction picture books I skim the text and focus on the pictures. The pictures in this book are incredible. Every page turn is a WOW moment. I was pleased as well, to find in this book interesting stories describing the trees and interesting history of each life. This was pure pleasure reading. Now I want to begin my own quest for trees, but I think I’ll just start with Ohio. This one is just as good as the first book Thomas Pakenham wrote about trees, although this one is full of tragedy. The story about the oldest living tree (over 4,000 years old)in the world (now no longer living because the idiot who measured its age with the standard special drill bit broke said bit in the tree and got permission from the park ranger to CUT THE TREE DOWN to retrieve it)just kills me. Due to the fact that I may one day be taking this tour I thought I'd see what I had to look forward too and I'm now excited to see these trees in person esp. the Baobabs and tree shrines. Though after reading the section on "trees in peril" I feel like we should hurry and start now and see them before they are gone. The hardest one to read about are the Totaras, the lost giants that will have no successors, very depressing. This is a beautiful book with illustrations of trees from all over the world. There is one photograph in particular that keeps drawing me back to it - a picture of red sequoias that looks beautiful yet mundane until you notice the very tiny person next to the trunk of one of the trees. And then the entire picture is transformed from a nice picture into a spiritual awakening. A wonderful picture book with accompanying text on truly remarkable trees, such as the Bo Tree of Sri Lanka, reputedly grown from a cutting of the original tree under which Buddha found enlightenment and the ancient Gingko of Japan, planted in 1232. Companion to Meetings with Remarkable Trees. Amazing pictures and enjoyable text. A coffee-table book that won't gather dust. Author not focused just on height or just on age or just on girth. He had to go round the world to snap these pictures. One of my favorite (my favorite?) coffee table books anywhere. 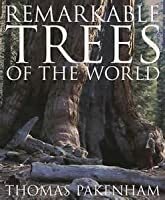 If you love trees, and even if you don't so much, I suspect this book will make you smile and wherever you place it emanate the good energy of the remarkable trees of the world. This is really a book of photographs of trees - superb photographs mind you!. With each photo there is a page or so of where that particular tree is - some history and other anecdotes. All quite interesting if you like trees and natural history! My favorite coffee table book ever. Amazing photographs, beautiful to me. This was a very interesting about weird and magnificent trees around the world. I highly enjoyed looking at the various odd trees. Interesting, but more text would be nice, maybe maps, etc. Saturday, 3 July 2010. Stumbled upon this book while browsing in the Cannon Beach Book Company. Superb! Must order the hardcover version. Sue lent me this book and the photos in it are astounding. The write-ups are also beautifully done, but it's the images that really grabbed me. Definitely nature at its most remarkable. My favorite tree book ever. Update: I just had to consult this book. A friend showed me her bonsai baobab tree which has captivated my attention ever since. Every write up of each tree is like meeting an interesting person. They each have their own story to tell. The pictures are amazing. We love trees. When we can't go see them for real, we enjoy pictures, and these are wonderful pictures. Beautiful trees, so love all the different places that care and preserve these trees. Thomas Francis Dermot Pakenham, 8th Earl of Longford, is known simply as Thomas Pakenham. He is an Anglo-Irish historian and arborist who has written several prize-winning books on the diverse subjects of Victorian and post-Victorian British history and trees. He is the son of Frank Pakenham, 7th Earl of Longford, a Labour minister and human rights campaigner, and Elizabeth Longford. The well know Thomas Francis Dermot Pakenham, 8th Earl of Longford, is known simply as Thomas Pakenham. He is an Anglo-Irish historian and arborist who has written several prize-winning books on the diverse subjects of Victorian and post-Victorian British history and trees. He is the son of Frank Pakenham, 7th Earl of Longford, a Labour minister and human rights campaigner, and Elizabeth Longford. The well known English historian Antonia Fraser is his sister. 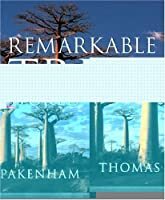 After graduating from Belvedere College and Magdalen College, Oxford, in 1955, Thomas Pakenham traveled to Ethiopia, a trip which is described in his first book The Mountains of Rasselas. On returning to Britain, he worked on the editorial staff of the Times Educational Supplement and later for ,i>The Sunday Telegraph and The Observer. He divides his time between London and County Westmeath, Ireland, where he is the chairman of the Irish Tree Society and honorary custodian of Tullynally Castle. Thomas Pakenham does not use his title and did not use his courtesy title before succeeding his father. However, he has not disclaimed his British titles under the Peerage Act 1963, and the Irish peerages cannot be disclaimed as they are not covered by the Act. He is unable to sit in the House of Lords as a hereditary peer as his father had, due to the House of Lords Act 1999 (though his father was created a life peer in addition to his hereditary title in order to be able to retain his seat).